Peanut Butter Cup Witch Fingers – homemade Reese’s peanut butter cup filling, covered in chocolate and topped with an almond sliver nail. A perfectly spooky Halloween treat everyone will enjoy. Peanut butter lovers, young and old, will be eating them by the fingerful! 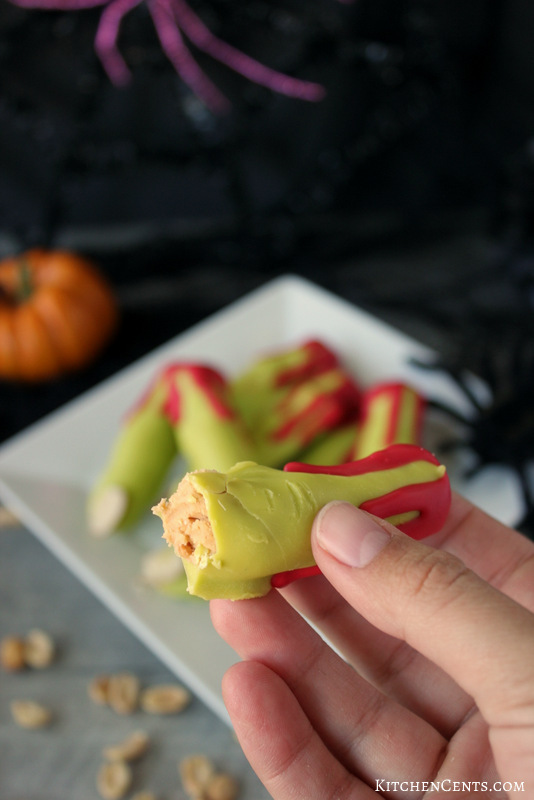 Looking for a last-minute, easy Halloween treat every zombie will love?… this it is! 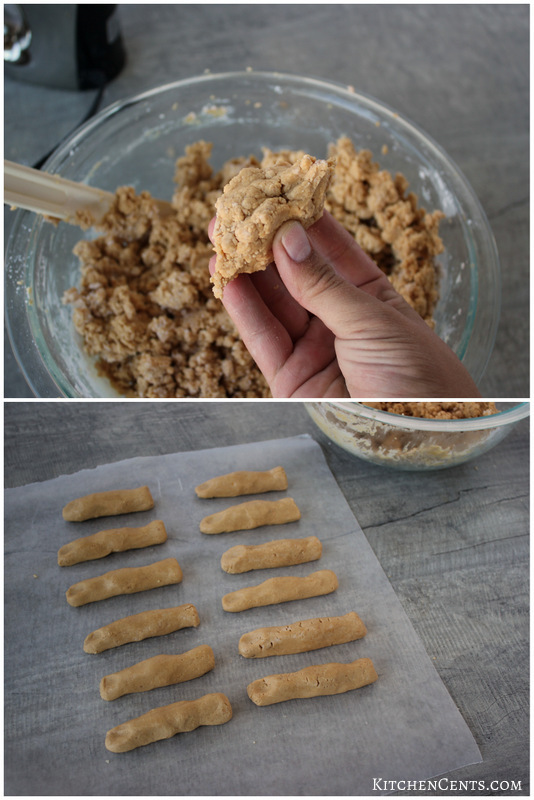 These sweet peanut butter-y witch fingers are delicious and so fun for Halloween. It takes 30 minutes or less to make a batch of these in under 30 minutes. Quick and easy, FUN treats like that are our favorite! 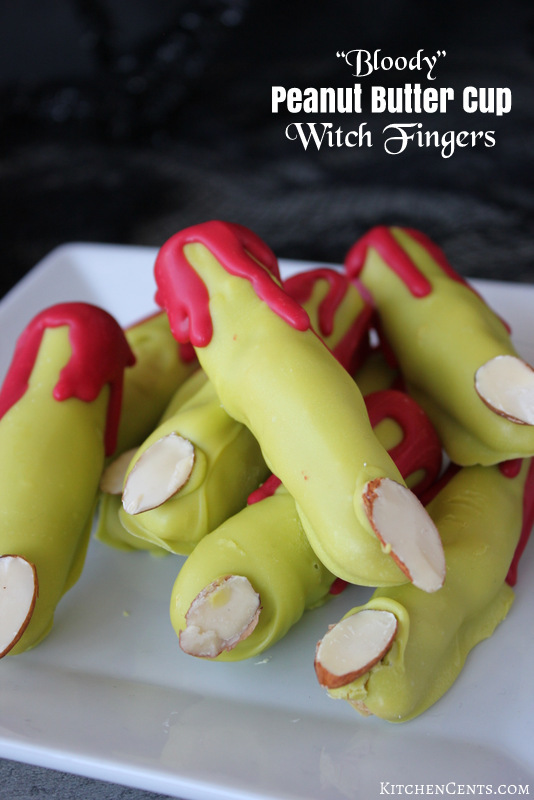 To make these fun, festive (kind of creepy 😉 ) witch fingers this is what you’ll need. You’ll be the coolest and all the kids (and adults) will love them! 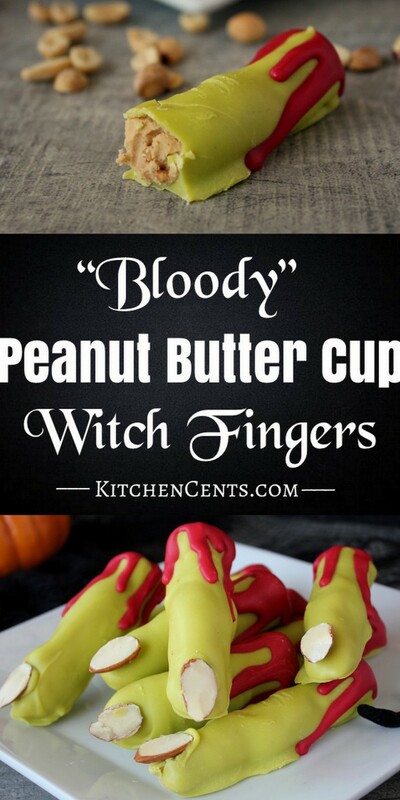 To make these awesome witch fingers, this is the Reese’s Peanut Butter Cup filling copycat recipe I use. You can find the full printable recipe here, or by clicking the button below. It’s so easy to make and the closest recipe I’ve had to actual Reese’s peanut butter cups. This peanut butter filling recipe is the best. I’ve been tweaking it to perfection for years. It comes together so quickly and tastes just like the peanut butter center in a Reese’s Peanut Butter Cup. 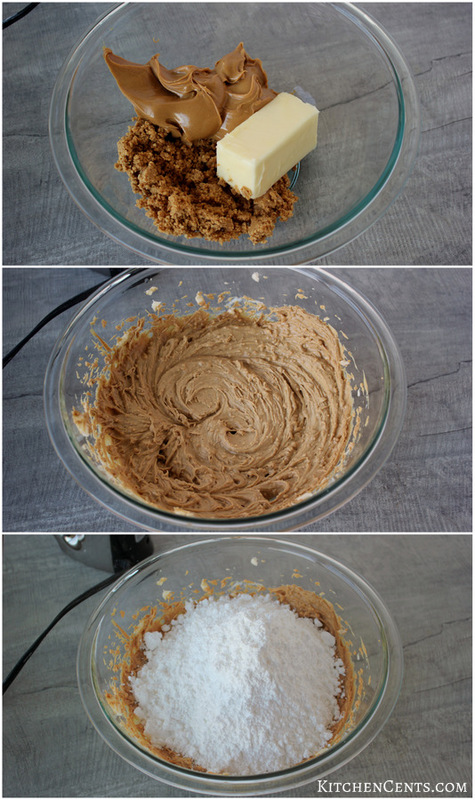 To start, cream the butter, peanut butter, and crushed peanuts together. When I say crushed, I mean tiny pieces but not peanut butter. I’ve tried so many different peanut butter filling recipes. Some with graham crackers, others with rice crispies. This recipe really is the best, at least in my opinion. 😉 If you read the ingredient label of a Reese’s Peanut Butter Cup there’s no graham crackers or rice crispies. Once the first 3 ingredients are mixed well, it’s time to add the powdered sugar. The mixture should look a little dry but hold together when squeezed. Once the filling is mixed, shape it into fingers. 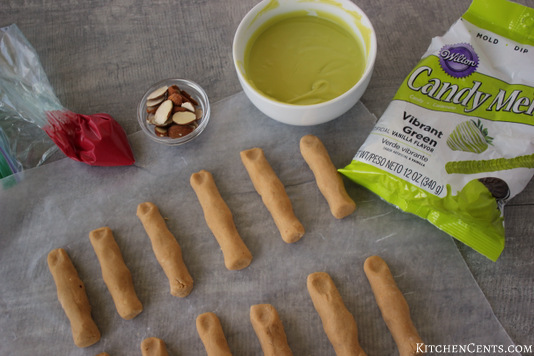 I used about 2 tablespoons of filling for each finger. Once the chocolate was on them it made the treat a 3-4 biter. If you think that’s a little too big or little for your taste you can experiment with the size. I liked the idea that once they were coated with chocolate they would be about the size of a real finger. To speed up the process and help the chocolate candy coating harden quicker, pop the molded peanut butter fingers in the freezer. In the meantime, melt the green candy melts and cut the almonds in half (to use as the fingernails). For ease, I used Wiltons candy melts (green and red). If you don’t prefer these you can use white chocolate and color it yourself. You may need to add a little oil to thin the chocolate as food coloring can make white chocolate seize (become hard even when warm). 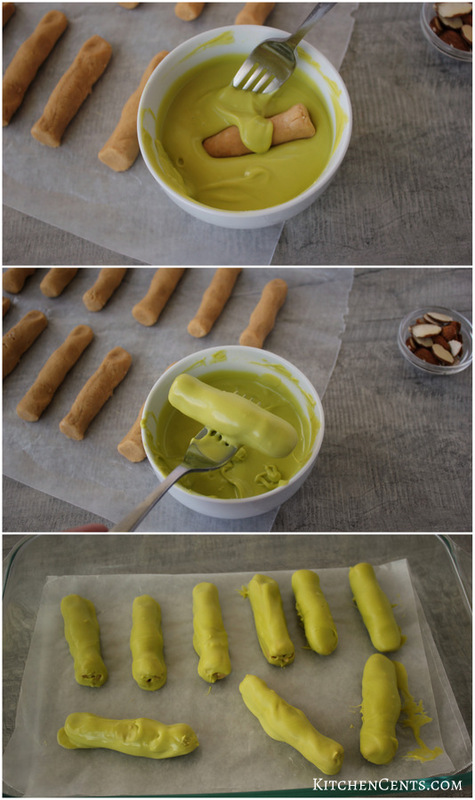 Once the chocolate is melted and almonds prepped the chilled fingers can be dipped in green (fully coat them) and assembled with an almond nail. After adding an almond nail to each I put them back in the freezer while I melted the red candy melts. You don’t have to but this will help the coating harden quicker. To save time on cleanup, melt the red candy melts right in a zip loc bag then cut a very small hole in the corner. Once you’re done you can just throw the bag away. 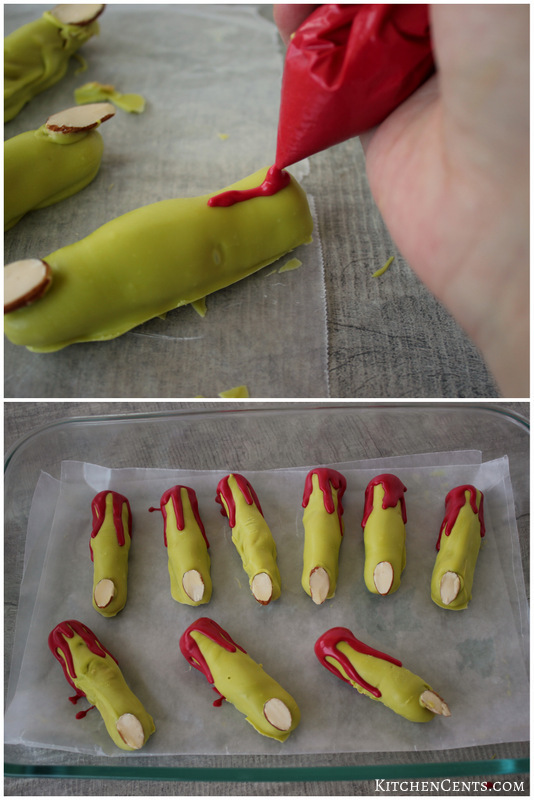 To give these witch fingers their spooky “bloody” look, drizzle a small amount of red candy coating to the end opposite of the almond nail. I tried making mine look like it was dripping. If you are in a big hurry, pop them back into the freezer for a bit. Otherwise, serve at room temperature. That’s it! They’re that quick and easy AND when all your ghosts and ghouls see them they’ll be gobbled up just as quick! I made these for a Halloween party last year. They were one of the 20 desserts that were gone first. My brother-in-law raved and still raves about them today. Trust me when I say they have the fun Halloween factor and taste delicious! We hope you all have a happy, safe Halloween this year!!! Looking for MORE fun Halloween treats and ideas? Find them HERE! Too spooky for you? 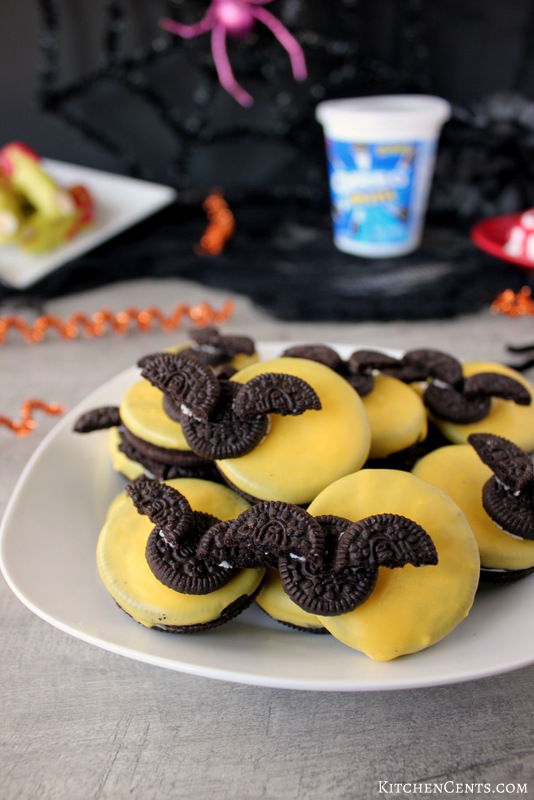 Check out these cute, 5-Minute Full Moon Bat Cookies!